I don’t know what is happening with my blog but this is the second time I have to cut a post in two parts because when I publish the original it only shows half of it and the rest of the post is lost. 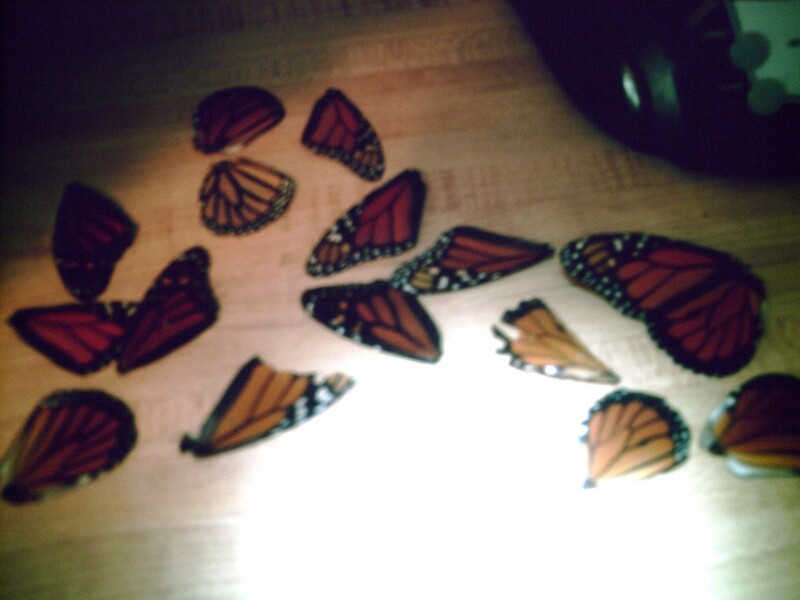 So back to the Monarch butterflies. Here is the other half of the post. Please refer to the previous post so you know what’s going on with these Monarch wings. 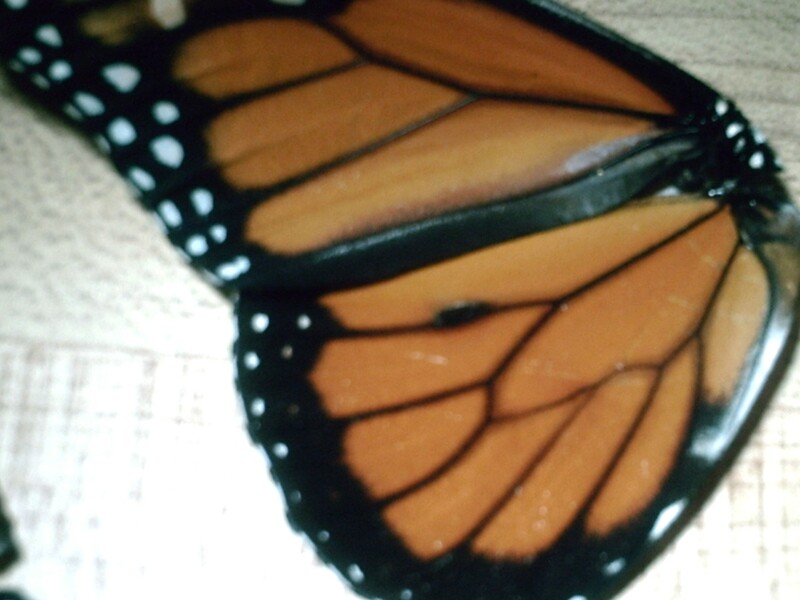 Monarch female wing – no black dot. More male wings; there is one that looks as if it had been picked thru by a predator. This is unlikely as Monarchs are poisonous to birds, insects, and mammals as they have milkweed in their system, from when the larvae nourished itself with milkweed. 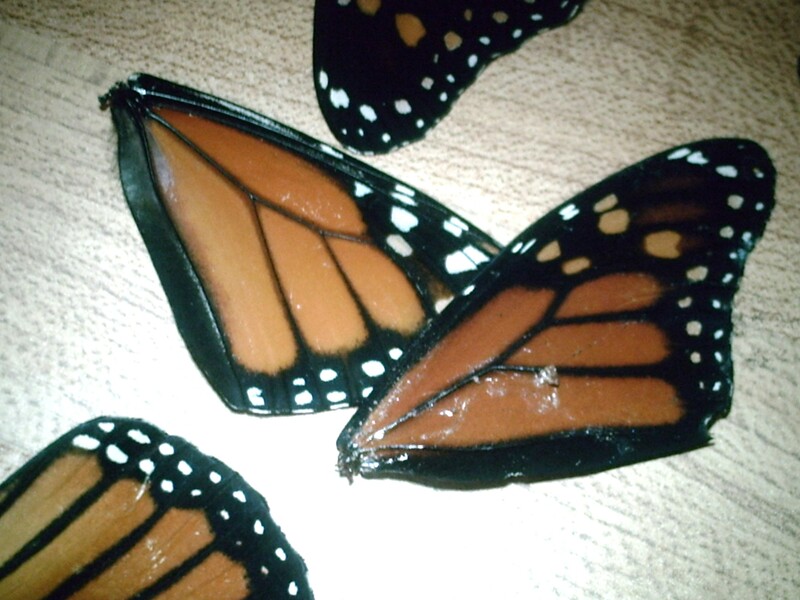 I don’t know what I will do with these beautiful wings, maybe I will frame them, but they are too beautiful to discard. They remind me of the fragile beauty of this Universe and of how blessed I am to be able to admire it. It is a priviledge that I don’t want to take for granted. This morning, as I sipped my coffee outside, I was talking to my husband and noticed one Monarch butterfly wing on the ground. I picked it up and was observing its beauty and for the first time realized that it feels similar to a bird wing, except thinner. 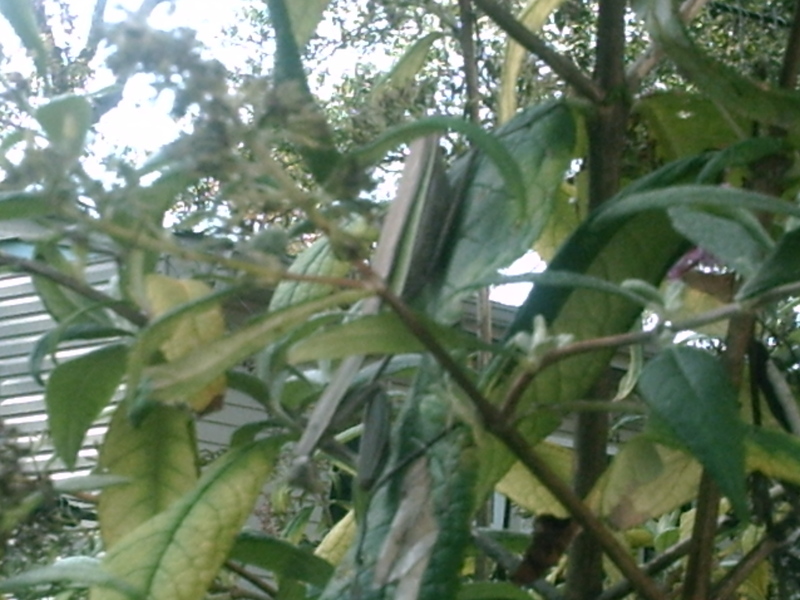 Then my husband told me that he saw another one behind the butterfly bush. We went to see if we could find it and found tons of butterfly wings all over. It was a sad and beautiful thing at the same time – the only way I can describe it. 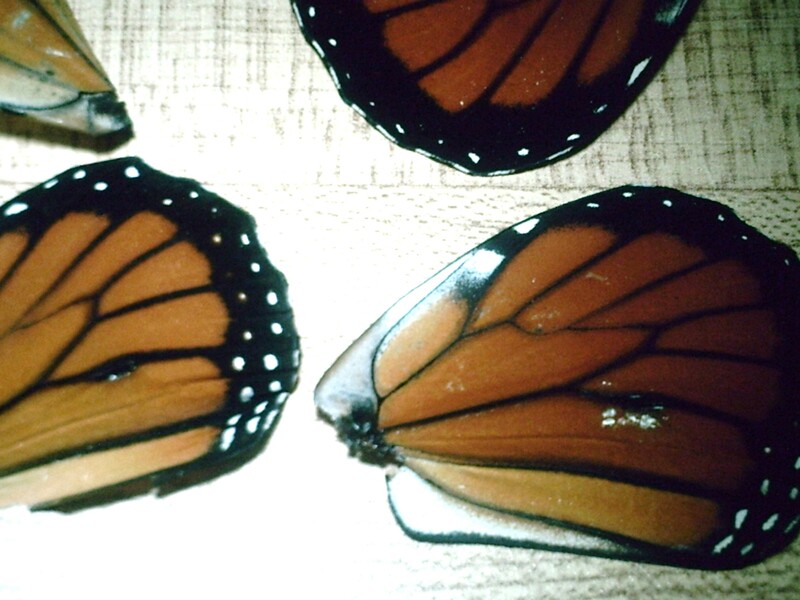 I picked up the wings and believed that there most have been tons of butterflies that die; however upon closer inspection of the wings, I realized that maybe only 4 or 5, according to the wings remains. On my research I learned that most of the wings belonged to male butterflies, as they have a black dot in one of the veins. I also learned that there are four generations in a year – March/April, May/June, July/August, and September/October. The last generation is the only one that gets to migrate, the earlier generations die. So I am not sure if these are from a third generation that died or from a fourth generation that was born and died due to the recent cold temperatures. I doubt that they were eaten by predators, since Monarchs are mostly poisonous to birds, insects, and mammals due to their diet – Milkweed. When we moved into this house there were no flowers or plants only grass. Over 10 years, I had grown a garden and planted two butterfly bushes which feed a lot of butterflies and even the occasional hummingbird. I get tons of hummingbird moths as well, an amazing sight. One time I attempted planting carrots and got butterfly larvae eating on them. I left the plants so the larvae could nourish from it and continue its life cycle. The larvae was Monarch butterfly larvae. It was feeding from carrots; however most information I have read points out that it only survives from milkweed. I don’t know but they were eating carrot plants and pooping to their contentment. 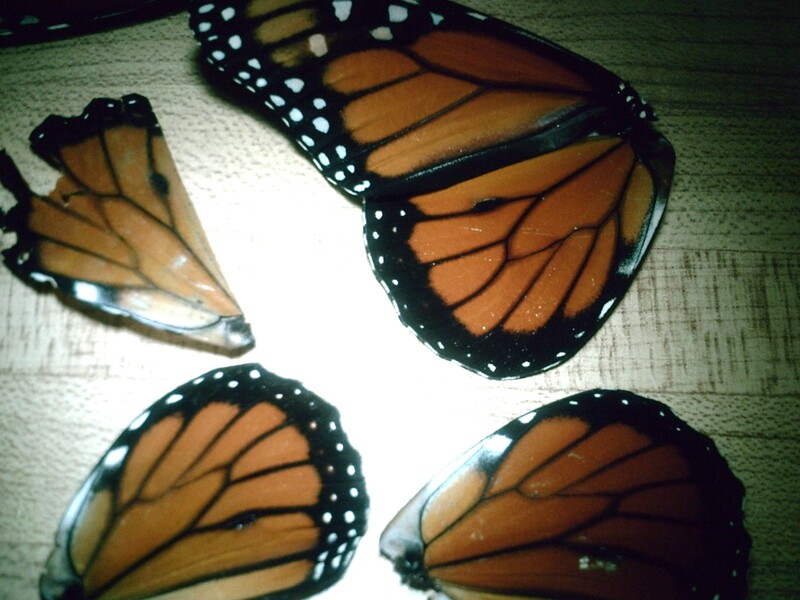 Later that season I saw tons of beautiful monarchs being born. One of them even came to me when I was sitting on my steps, and rested on my hand, as if saying thank you for feeding me. Here are the pictures of this morning’s findings, what looked like tons of fairy wings. 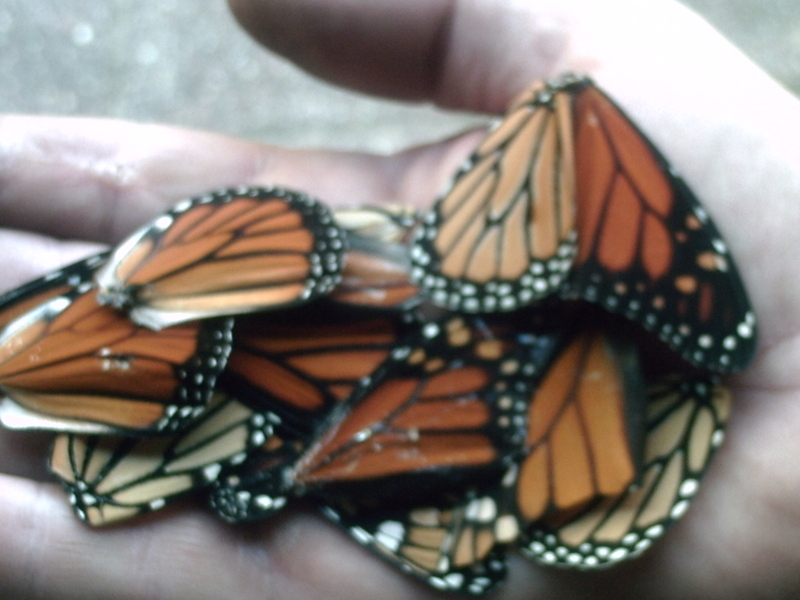 Tons of monarch wings in hubby’s hand. 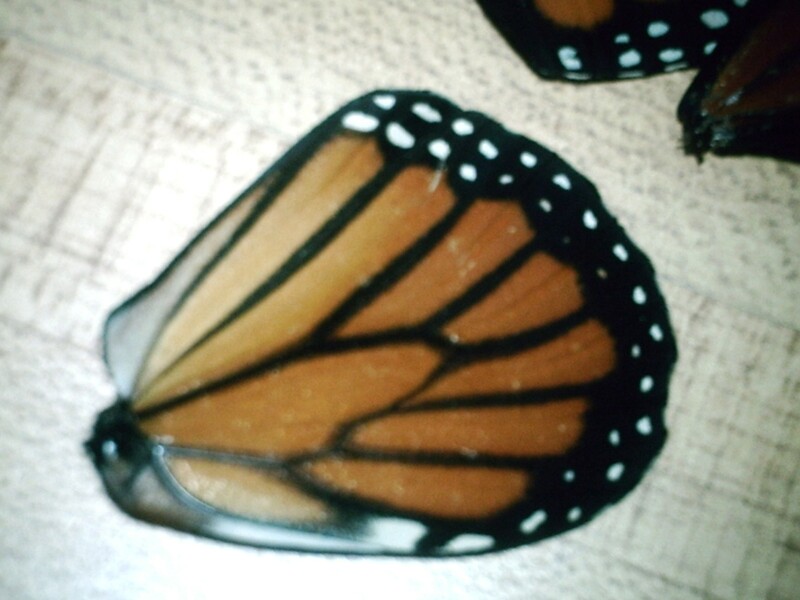 Monarch wing. This is a male, see the black dot in the vein. The rich colors suggest that this might be a fourth generation that never got to migrate.